The Top Gun Aerobatic Stunt Flying experience is one of the UK’s best Flying experience days. 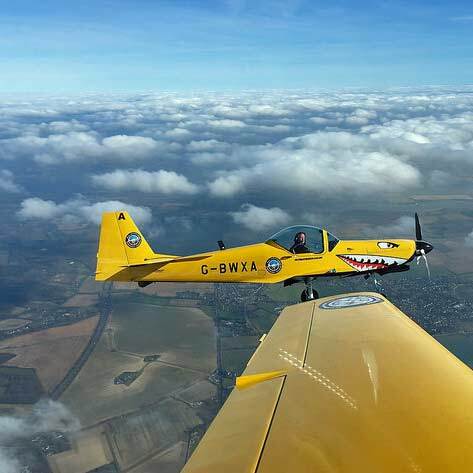 If you’ve ever fancied yourself blazing through the skies on the tail of the “enemy”, or being pursued by a fighter plane you just couldn’t shake off your tail, then this is your chance to try it for real. Yes, that’s right, try the Top Gun flight experience yourself, and even take the controls under the watchful eye of your expert pilot instructor. This is awesome – the UK’s best price for this experience! It came as some surprise to us that in a single outing you can learn enough to take the controls and do some stunts yourself, but the instructors are so good that you really can. Yes, you’ll be able to take over and do some of the aerobatics all on your own. Now how does that sound. Or if you think Top Gun is a little too exciting for you, then give one as that special treat for Father’s Day, birthday, Christmas, or in fact any time. We’ve brought all the aerobatic offerings from the major experience providers together in one place for you to compare prices, so find the one you fancy, click through and check out the detail. Fun, excitement, and more fun and excitement is our conclusion after testing this stunt flying experience day. We never imagined we’d get to take the stick ourselves, and how much our instructor could teach us in so short a time. You’ll start with a vital safety talk from your ex-military instructor, then it’s on with the flying suit and parachute for your flight in the Extra 300 plane, one of the world’s top aerobatic planes. Learn about tactics, manoeuvres, and getting the most out of your plane, then it’s over to you. Take the stick yourself and see how you get on chasing down the other plane!! It’s not a cheap experience, but then you get what you pay for and we considered it money well spent for a thrilling experience you don’t get every day of the week. The locations for this experience are quite limited, as you’d expect, but we think it’s well worth the trip, wherever you live, if you want excitement and aren’t afraid of being upside down in a plane. It certainly makes ordinary flying experiences look tame. Top Gun aerobatic stunt flying4.33333333333Sarah FirminAerobatic flying experiences are a cut above the regular flying experience days. Take one of the world’s best aerobatic planes, an ex-military instructor, put on your flying suit and parachute, and it’s chocks away!! See if you can hunt down and catch the “enemy”, or if he will escape and chase you instead!